I'm Zach Collier, from Austin, Texas, and I love making all sorts of things. Thanks for checking out my portfolio of stuff I've made. Like anyone who has created cool things professionally, I'm unfortunately unable to share some of my favorites. Good news: I can still show you some of the things I made as personal projects or for clients or past employers who don't mind sharing. Here are a few you might like. To check out my projects, either scroll down through all of them, or click/tap on an icon above to jump directly to a particular project. Have any questions or comments about anything you see on here? Send me an email at info@zachcollier.com. I'd love to hear from you! I once made a TV commercial for the mobile app from a major university. I also worked on the first version of the app, and eventually helped lead the team building later releases. Small world. 95% of the content in the commercial is my own work, including the concept and most of the illustration. And I wrote, performed, and recorded the music using real instruments. Nice little riff, if I do say so myself. This commercial played for several years on the Big Ten Network, as well as on the big screens in the university's basketball arena and football stadium. I created a mobile app framework for building hybrid HTML5 PhoneGap/Cordova apps for iOS or Android. Apps built with this framework are, to some people, indistinguishable from pure native apps, including things like fast momentum scrolling, device features like GPS, compass, and photo uploading, and a clever (if I do say so myself) system for caching data for offline use without using HTML5 application cache. 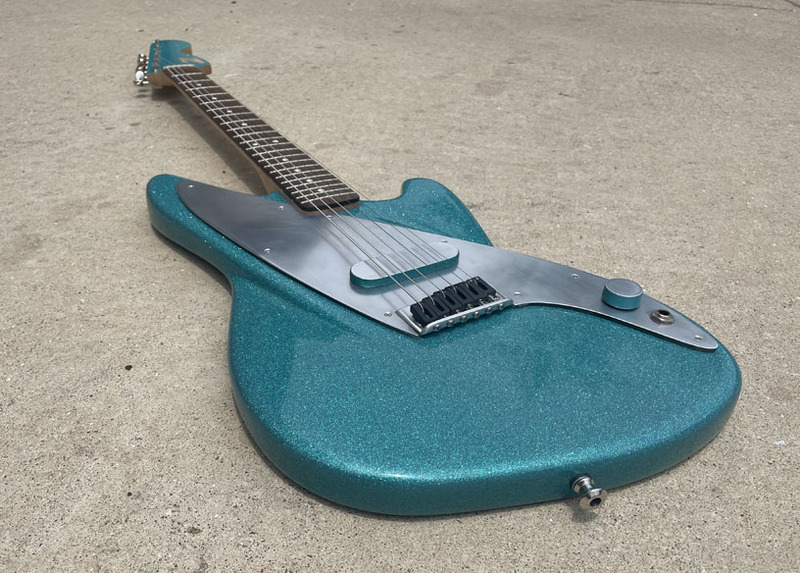 After never being completely satisfied with available mass-production guitar designs, I began a project to design the perfect electric guitar for my own personal use. 1. The guitar must look awesome. 2. The weight and balance must lend themselves to easy use on stage. 3. The electronics must sound good and the controls must work reliably. 4. Money must be saved where possible without sacrificing the end product and experience. 5. A green sparkle finish makes everything cooler, so use it. I love the general Fender electric guitar aesthetic. I have owned several Fender guitars, and still own and play two. But none of them were ever quite perfect. I wanted to see just how close I could get to “perfect” without spending thousands of dollars at the Fender Custom Shop. 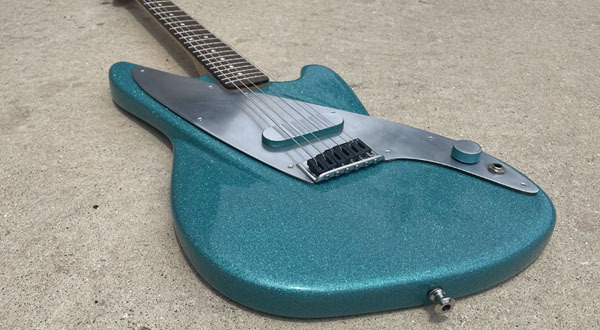 I have no complaints with most Fender neck designs, but none of the body shapes or control and pick guard layouts ever hit the sweet spot for me. This led me to start with a classic Fender Mustang neck, which has the 24-inch scale length I prefer and a great-looking headstock shape. Done deal. For the electronics, however, I needed to take the custom route. 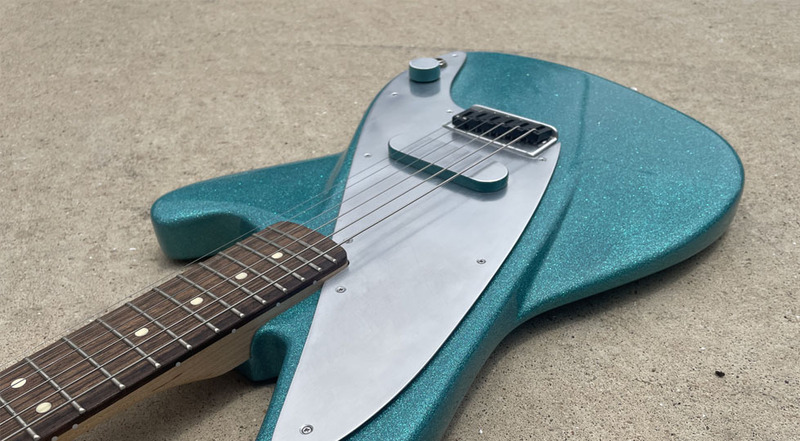 Most electric guitars come from the factory with more than one pickup (the electronic component which, through a few fun physics tricks, turns string vibrations into sound). These pickups usually use some combination of knobs and switches to modify their output and produce a wide variety of sounds. This makes a single guitar quite versatile. In my experience, extra switches a knobs simply get in the way while playing a guitar on stage. And I found that I, personally, always found one setting for my instrument’s pickups that worked well for me, and I left it there forever. My goal was to eliminate all switches and tone knobs. A master volume knob, however, could be quite useful, so that made it into the design. I based all of the electronics around my favorite electric guitar pickup of all time: the original Seymour Duncan Hot Rails. I already used these pickups in two of my guitars, so I knew their capabilities well. And I also knew that a simpler signal path, completely bypassing any tone adjustment knobs, would provide a beautiful, biting sound that was just perfect for the type of music I was playing at the time. I used a single Hot Rails through a volume knob. That’s it. Straight to the amp. No muffling tone knobs, and no switches to activate accidentally. This is the part of the project where I could play around the most. I started with a big block of poplar wood, designed my own custom shape, and started cutting, routing, and carving. More details coming soon. It's a very 3D design, with a sort of pretzel-like effect with the upper and lower horns wrapping around on each other. 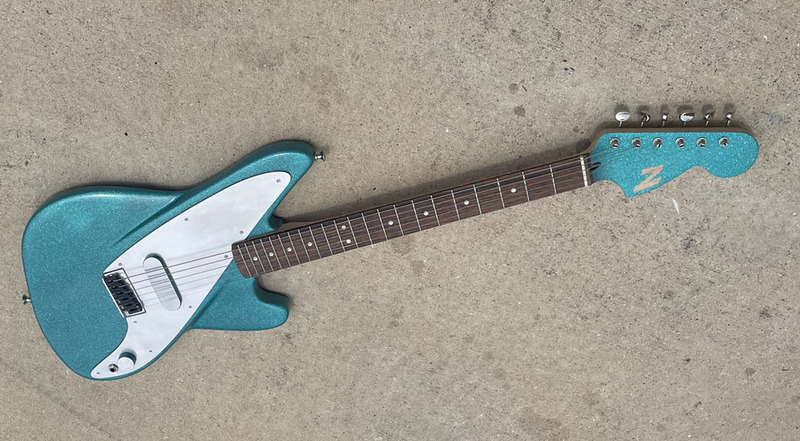 The bridge is cut from a chunk of aluminum, and the white plastic pickguard is made from the front of an old dishwasher. 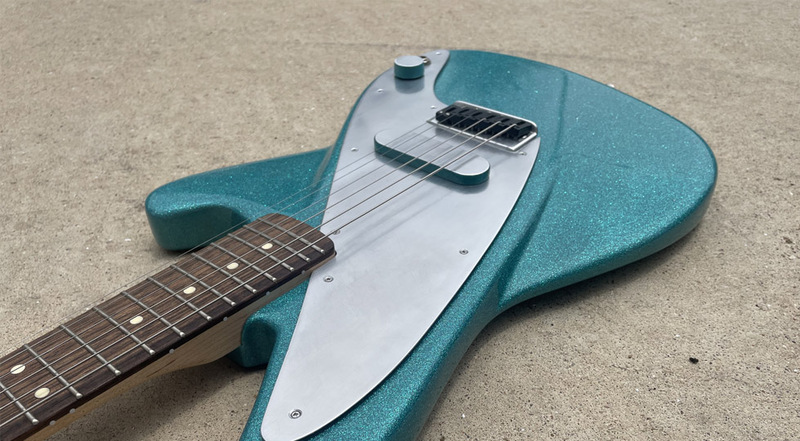 The odd shape of the pickguard was designed based on the pick scuff patterns on my other guitars, so on this design, my pick never hits the painted part of the body. 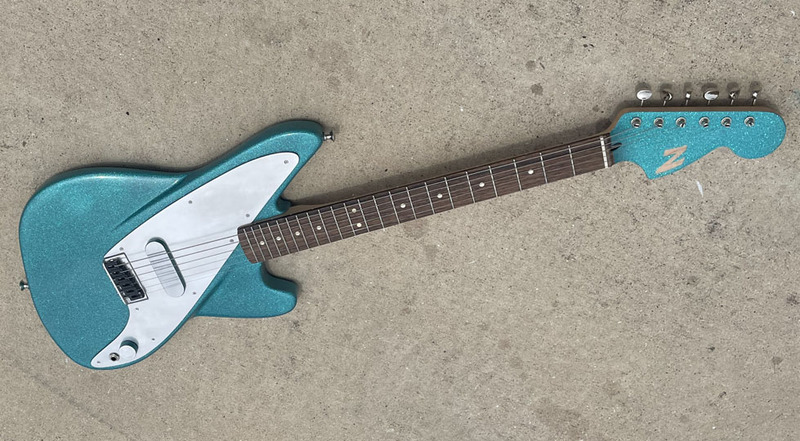 I've played this guitar live on stage and on recordings for years, and I always get questions from other players wondering where I "found" such a cool guitar. 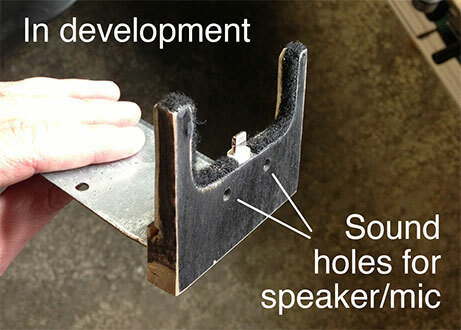 Much like the guitar project mentioned here, when it came to iPhone car docks, nothing on the market suited my needs. This called for a completely custom design. I built the dock out of steel, aluminum, plexiglass, and wood. Games are awesome. I always thought that a cool way to control an iOS game would be to use the internal compass to direct an on-screen character and allow the player controlling the game to rotate the entire iPhone or iPad to rotate the game world around the always-moving character. I had the idea for this game for a few years, and finally sat down to build it when Apple released their new Swift programmign language. This game, called "Go West! A Compass Adventure", is written entirely in Swift 3. This is a product entirely of my own creation. I designed it, wrote all of the code, created all of the graphics and sounds, and wrote and recorded all of the music. I made this cool animation in Flash, and used Google's awesome Swiffy to convert it to HTML5 for your viewing pleasure. It's pretty large now that it's converted to HTML5 (1.6 MB), sorry! So wait a bit for it to load. Try to find and click on the secrets. Find all ten! I worked with the Kuali Foundation as part of the team creating an open source mobile app framework, and at a conference I lead a presentation to build interest in the project. Just for fun we set up three iPhones, in landscape orientation, on microphone stands converted into simple tripods, and a friend sat in the front row and followed me around the stage with her iPhone in portrait orientation. I later cut these four videos together, along with audio from the sound board and a stream of the slideshow, to make this video. Take a look. I live in Austin, Texas, and you should, too.